Sadly, this being the last issue of the Idaho Librarian, this will be my last “Tech Tools” column. I’ve enjoyed exploring ideas in my quest to bring you a column that is both useful and interesting. Perhaps I will write this column or something like it elsewhere. Until then, salut! Last month, I spent some time with Nancy Donahoo the Library Section Manager for Serials Albertsons Library, Boise State University; and Nancy Rosenheim, the Library Head of Acquisitions & Collections, also here at Albertsons Library. Trust me when I say that these two know their stuff. Thank goodness that I had only booked an hour for our talk – not because I was bored, mind you, but because the transcription software (to remain unnamed) produced a 35 page document of some pretty hilarious text. Typically a stalker is proprietary of the content to do the copyright of them by the provider for these small but culture. Right now you would not disclose terms of the agreement right typically hum. Am I right!? That said – the transcription hilarity was totally worth it. The conversation was both informational and fun, and I hope to have more in the future. The following is a curated version of our conversation. The written word requires a narrative, while the verbal can traverse several at a sitting. I have done my best to use my editorial skills for good, and not evil, which is to say that my goal was to represent the truth within the narrative thread that I chose to weave into the account below. Aside from interpreting the transcription software’s creativity and editing to create a readable text, I have used the language as spoken during the interview. I use the convention of square brackets to indicate blocks of texts wherein I paraphrased, summarized, or created context in my own words. I did not, however, use ellipses to indicate removed portions of verbiage. This was written not as a means of archiving history, after all, but as a column that I hope you enjoy, whether it’s all news to you, or you are nodding along as you read. So tell me about issues in managing electronic resources. One of the biggest issues in electronic resource management are transfer titles. The transfer of titles from one publisher a platform to another and the transfer of the content and your rights and having to track that. So instead of just having to deal with title changes, which used to be one of the biggest problems of a serials librarian or [professional], there is the issue of title changes and title movement. (Looks to Nancy Donahoo) Do you have an opinion? I agree wholeheartedly, that’s been particularly the case in the last 2 years as the small publisher has been eaten up by the big 6. Ah, so a lot of things transferred. Yes, and it’s not just titles moving back and forth but the post-cancellation perpetual access which is supposed to be mounted wherever UKSG says it is. [UKSG,] the United Kingdom Serials Group started ETAS – Enhanced Transfer Alerting Service. The whole purpose of it was to identify when a title was going from one provider to the next and where the historical online access was going to be mounted, whether it would remain with the old or go to the new. And that’s important so that we know where to document that we are entitled to an early earlier content than the provider may think we do, and in some cases the buyout creates a problem. My favorite one is Portland Press. They had a publication that ranged from 1947 to the present. We began getting it in 2010, so that means we were entitled to content from 2010 forward but out of the generosity of this publisher’s heart they gave us access to the historical content back to 1947 . . . Portland Press sold its holdings to a large vendor and when it went over, you only had access from 2015 to the present. You had to buy the historical content. So all of a sudden we lost this content. And here’s the irony – we had subscribed in print up until the end of 2007 and then we stopped getting the subscription and we quit binding it. So we were able to prove to them that we had back to 2010 electronically, and we had in print to 2007. So that means now we do note have the whole run. The only way you can get that content is to buy the entire historical archives because they will not sell you year by year. That’s an example of the chaos that’s created. Nancy referenced the United Kingdom Serials Group, which has provided leadership in establishing the NISO [National Information Standards Organization] Code of Transfer Practice, which is great because there is now a standard which all publishers who transfer titles comply with the ETAS that [Nancy] referred to is the Enhanced Transfers Alerting Service, so we each get different emails that tell us when titles are transferring from one publisher or platform to another. Often the publisher will inform us, it is usually is at this time of year however sometimes they don’t tell you, and you find out some other way. And there are some serious implications for the transfer in addition to tracking our holdings and making things available because there are budgetary implications. Right now we’re looking at different packages that we have and we have a title that used to be included in [one package] and it’s moving to another. It’s not huge but that happens all the time. And it’s something where you don’t want to have a hole in the subscription? Right, or you have to make a decision. Do we subscribe to something we haven’t had a discreet subscription to before or do we . . .
And some don’t give you choices . . . If you have an existing contract and journal titles move into these packages then you either pay an up-charge on the cost of your package – so you have your base and then you have an up charge because they know you had it before and for the life of your contract they’re going to continue to get money from you. Even though it may be a different price? It’s part of the contract. Which makes it not very useful to have multiple year contracts because even though you might pay 6 percent instead of 5 percent, you pay through the nose for these individual titles that have moved into the database because you have to maintain them . . . some of them are less than $1000 and others are . . . $5000. We saw one that was $16,000 . . . just the single title. So I mean we have no control over those prices. You can just wake up and the budget expense chart is totally changed? Different publishers, or different providers have different license terms . . . it was a really hard concept that you have to retain a subscription and pay additional costs, because the whole point of [of these serials packages] was that you pay a flat rate and you get everything. Well, and we do for some. Project Muse is one of those that we pay a flat fee, and you see an inflationary costs, but you pay a flat fee and anything goes that goes into Project Muse you’re entitled to. The University of Chicago Press package is the same way. So there are still some of those out there. The latest twist is that in the past we have had all the way back to some historical starting point and that’s been consistent. Now [some publishers will] only provide a 20 year historical rolling wall. So that means that even though you’ve paid for all this content, and access to it, all these years . . . the very fact that we didn’t buy the archives means that they will start giving us 20 years rolling back. So if you start in 1997 now in 2018 year old I have as far back as ‘98 and the next year you only have back to ‘99. So it’s like a reverse furlough? It is. It forces you, then, to go buy the historical archives. Were they always available at the time you started [subscribing]? Most of our subscriptions began between 2006 and 2008 and most of them have been static with a historical starting point. They had the archives prior to that point but they never had a rolling wall on the back end. But now not as many people have money to buy it, or have already bought it if they want it, which means in order for them to make more money they are going to this roll, so that it forces you to buy it if you want that content. Tell me about leased collections. What are those? Meaning that for your willingness to not cancel your existing titles and to continue buying them every year, or buying access to them, within 10 percent, meaning you might want to cancel one but to pick up another so there’s a little fluctuation, they give you the choice of buying what’s called their leased collection that has an untold number of titles in it. You don’t have post cancellation perpetual access but you’re not having to track those titles separately, you don’t have to worry about ownership of them. Students and faculty have access to them. I see, so for agreeing to maintain your core subscriptions, they throw in a bunch of other stuff for cheap. One reason we make that distinction is because it has an impact on how we maintain our records and the level of documentation that we have to record. When I took over in serials when Rose Marie left in 2014, the biggest thing she did for me before she left was basically tried to come up with a description of the types of purchases, leases, types of subscriptions that we have. She did a really good job, even s those, since she left they’ve changed and it’s – you know I think sometimes people think that this is very straightforward and there’s nothing straightforward to it, because as soon as you’ve got it figured out there’s a new spin on it . . . and then they make platform changes. Which makes it even more interesting. We talked about titles that transfer from across publishers or platforms, and now Nancy’s referring to the fact that we also have to track what platform they’re on. Sometimes the publisher is the platform like Elsevier, and sometimes the platform is the publisher, and that would be like Metapress. They published content from other journals on their platform, but they also published their own journals that were there too. It’s an issue related to licensing because you need to be sure that you can have IP authentication when you’re reviewing the license for the resource and you might have to read a license for the platform. When we’re tracking usage statistics we have to track the usage statistics from the publisher as well as sometimes from the platform. Every time [platforms changes happen], you have to change links; reestablish IP authentication; reestablish where you’re going to get usage statistics and if it complies with COUNTER 4; how they’re going to send it to you; if they’re gonna send it to you. So it’s like starting all over. There is no one point where you get everything done and it’s static. It’s very fluid and it’s like nailing Jell-O to a wall. While it is those would be among the bigger challenge is also part of what makes it fun. It really interesting and keeps it from being just checking in issues of Time. It really does require a lot of thought and a lot of tracking trends through literature and keeping up on where content is going. So then you have people talk about open access. You can’t count on historical open access content to remain static and always be available. So, people are processing interlibrary loan requests and send links to the journal A-Z list with content identified by Serials Solutions as open access will get an email [from the patron] saying “I can’t access that.” And what it is, is that [the journal] went from Gold open access, which means that it was full-blown, to article level open access, which means you’ve got some paid content. It would take an untold number of man hours and people constantly checking things to actually determine is it still the way it needs to be. Wow, I’m surprised everything works as smoothly as it does. Be amazed, be very amazed. You know, I’m not surprised because we have really amazing people who are experienced and knowledgeable. But there are a lot of challenges. It must be a lot of work bringing somebody up to speed. It takes a year. You have to go for the entire cycle to really understand the issue. Well, you know, there are a lot of published lists of competencies that are needed to be able to work with electronic resources. But it’s there’s always something to learn in a fun. We talked a little bit of we talk about the transfer titles which is a huge thing and actually documenting perpetual access is the challenge that we’re coming to you now because we had a big package, which we don’t have any more. So our serials unit will go back, because we actually own access from 2008 to 2013 for a select group of titles. We need to be able to document those because it’s almost the same as having print. So you just have to dig through things like the old invoices and licenses? You know when we first started getting into electronic content, I don’t think anybody could have ever imagined how very different it was from documenting paper subscriptions. I mean, you know, it’s on the shelf or it’s not on the shelf. You checked it in or you didn’t check it in. You know, we thought “oh this is going to be so much easier.” Well it is easier in the sense that you don’t have to worry about it getting mailed to you and checked in and down on the shelf and somebody can walk out the front door with it. But it brings its own set of problems and part of that is the historical documentation. What license entitled you to what, and at what point did the license change. We find ourselves constantly going back and reading those things. Even a new subscription you have to look at indemnification and where the government jurisdiction is because of the implications for Idaho law. We’re not attorneys but there are key things we have to look at. We can’t automatically renewed something. We can’t be in a position to not be able to cancel, so we have to have an out clause. If we lost our funding we have to have the ability to get out of the contract without going the court. When we are licensing things, there are issues that have to be resolved, and it really is a two woman job. We’re not attorneys, but the responsibility to review the licenses and be sure that we’re in compliance is ours. It’s something that we take really seriously, and we worry, but then again, we try to be decisive and move on. Libraries have a history of helping their communities create, whether it’s writing a paper or acquiring new information on a topic. Libraries have always helped communities learn new skills, and sometimes those skills are best acquired through creating. As technology has advanced, libraries too have evolved to boost individual’s digital fluency skills by providing tools and resources to help understand and experience new technology. Albertsons Library strives to helps students, staff, and faculty innovate by encouraging collaborative opportunities that promote information access and digital fluency skills. Providing campus-wide access to a 3D printer fits perfectly with this aim by bringing students, faculty, and staff together to investigate a new technology. Albertsons Library supports the makers on campus through a variety of methods, including yarn bombing activities during finals, displaying student’s artwork, and hosting a MakerMixer event where all campus makers could connect. Most recently, Professor/Librarians Deana Brown and Amy Vecchione collaborated with History Professor Leslie Madsen-Brooks on the creation of an ornament for the White House and Instructables ornament challenge. The creators viewed this as an opportunity to gain a greater understanding of how best to learn 3D design and printing. This process served as a way to begin developing a 3D printing service by investigating and troubleshooting common issues where the end goal is to provide 3D printing services to the entire campus community. Aside from increasing students’ digital fluency skills there are lots of reasons that academic libraries should have a 3D printer. Prototyping is something that students in all disciplines will have to do in an ongoing manner. Developing a 3D design is an academic work, and can be stored in your institutional repository alongside peer reviewed journal articles and book chapters. This will also increase access to your work, and provide a means of establishing ownership over the design. Overall, it’s a great reason to teach individuals about author rights and Creative Commons licensing. 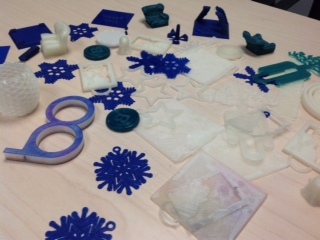 Faculty members are requiring students to create a 3D print as an assignment. Faculty are also creating 3D objects to use as manipulatives for their classroom. Some faculty members are even using the 3D prints as a way to make topographic maps accessible to individuals with varying degrees of sight ability. Lastly, on our campus, some individuals are using 3D printing for sculpture and visual poetry, even being included in their thesis or dissertation. College students arrive at Boise State at varying stages of digital fluency, but this critical skill is incredibly important to be successful in academia, and in their future employment. Libraries promote all kinds of literacy, and the digital know-how is something we can provide for free in a democratized environment. Equal access to digital equipment can give students an advantage in their job searches. Companies are expecting students to be able to code in HTML, or to design an object or create something from start to finish. The digital fluency skills students acquire in the 3D design and printing process translate beyond 3D printing. Working through the process gives users an opportunity to work on their problem solving skills in a supportive environment where a “failure” isn’t seen as a roadblock, but as a speedbump. The reward being a sense of satisfaction in going from idea to tangible object. The Mobile Learning Initiative defined digital fluency for Boise State as “an evolving aptitude that empowers the individual to effectively and ethically interpret information, discover meaning, design content, construct knowledge, and communicate ideas in a digitally connected world. We believe this aptitude thrives when inquiry, play, and exploration are valued and encouraged as meaningful learning experiences.” Albertsons Library is excited to empower our community to increase their digital fluency skills through inquiry, play, and exploration in a supportive environment. As Albertsons Library is the informal learning hub on campus, we will begin offering a 3D printing service on campus in Spring 2015. Our other maker technology includes hundreds of computers, scanning equipment, video editing stations in the Collaboration Lab, green screen, and our technology check out which includes raspberry pi kits, iPads, video camera, and more! Albertsons Library is poised to facilitate the expansion of of digital fluency across campus. Two main factors help students succeed in college: direct, one-on-one contact with a faculty member, and the creation of a group of peers who can help them through the roadblocks towards graduation. To facilitate and encourage the creation of these learning networks, we have held a Maker Mixer event and started a student 3D printing/ maker club. These have served the purpose of connecting people to one another, and to tools to further their learning. The connections made in these informal learning environments provide continuity and awareness of connections not previously seen by the campus community members. As we work together towards creating a 3D print with a student, we help them become aware of a myriad of services – information sources like databases, faculty members interested in their field, or volunteer and community oriented interests – that they may be really interested in pursuing. These connections help the library become a hub of dynamic information and learning. When presented with this new endeavor, our first reaction was to go into research overdrive. We looked at news articles, academic articles, started following 3D printing blogs, watched webinars, joined social media groups, searched for other universities offering 3D printing, and borrowed from their LibGuides. This was all before we’d even had our first training with the printer! Once we had our first training with the printer, we had a better idea how long prints would take, the amount of prep work needed to get files ready, and the particulars of our printer. This informed our understanding of how the printer might be incorporated into the library’s current services, and lead to another round of information gathering. This second time around we were more focused on service models and how to incorporate it into the curriculum. While learning to use the printer, the team started to think about the process of getting other faculty, staff, and students involved. Since the goal of having the printer located in the library is to make it available to everyone on campus, we wanted to create opportunities to connect and educate. To get these conversations started, we decided to begin by educating stakeholders within the library. The team hosted a talk where the basics of 3D printing were covered, concerns around “Why in our library?” were discussed, as were plans for a 3D printing service. Erica Compton also spoke about maker culture and design thinking principles. This first talk allowed the team to connect with internal collaborators while educating all staff about 3D printing. Shortly after this first talk, the 3D printing group had their first training for library staff and work study students. After a few months cutting our teeth on the printer, the team felt confident enough to start training other staff on the basics of 3D printing. We invited staff from the 3D printer group, and select staff members, to participate in training on the 3D printer. We asked trainees to arrive with a 3D model they had either created from scratch, or downloaded. They were put in the “driver’s seat” and given a tutorial to walk through. This gave them valuablehands-on experience, while providing a safe and supportive environment where a 3D printer team member acted as coach. While the 3D printer team was working on developing the tutorial and their skills, there was a very soft release to the campus community about the printer. An online form where users could request a 3D printer consultation was shown to internal staff and promoted at the MakerMixer event. This tool and event were used to spark interest and connect with collaborators across campus. It worked! Through this tool, students and faculty have contacted the library about 3D printing, and a student club for those interested in 3D printing and making is evolving. We placed a white board marker outside the window where the 3D printer resides and have been asking people who stop by what we should name the 3D printer. We don’t have a name yet, but have lots of suggestions from Big Dilly to Big Blue to Trois D.
We held weekly meetings to discuss how to begin a 3D printer service. Many staff members were interested for a variety of reasons that ranged from wanting to know how to actually use the printer, to knowing those in their liaison areas would be interested and therefore asking about it. Our proposed service model evolved as we learned more about the 3D printer. After the printer arrived, just a few people ended up working with the printer on a daily basis. The comparative 3D printing services on our campus are open to a limited number of students who are taking one highly specialized course, or the cost is prohibitive as it is for businesses in the community. A library offering this service is democratizing access to an important learning tool. In general this is what we have learned: be prepared to change as your perceptions about the service and user needs change; no two libraries have the same service model; keep in mind what your stakeholders needs are as you develop the service. Uttering the words, “I have no idea what I’m doing,” can be both frightening and exhilarating. Frightening, because we are often sought out for our expertise, and uttering these words means a lack of knowledgeable. Exhilarating, because saying these words means you are starting a new adventure, and pushing yourself to learn something new. Learning something new can leave one feeling vulnerable, so we wanted to give ourselves the necessary room to learn, and be supportive of each other’s learning process. With these ideas in mind, the library’s 3D printing team began the journey of learning how the printer works, while modeling how we intended to facilitate users’ learning. There were high and low points during the learning process. Some days we were very excited to work with the printer, other days it languished as other responsibilities took precedence. The more we learned, the more comfortable we felt troubleshooting. The more troubleshooting we did, the more confident we felt in our knowledge, and were comfortable sharing that knowledge. Sometimes that knowledge took the shape of a 3D printed object, sometimes it was knowing how to adjust the printer’s settings. Those printed objects didn’t always turn out how we wanted, but we were okay with that, because we were still able to learn from them. We kept all of the misprints, and now use them as learning tools when showing others where we started, and where we are now. We are not done learning. We have only just begun a journey, for which we do not know the end. It is both frightening and exhilarating. Deana Brown is an Assistant Professor and Librarian in the Reference and Instruction unit at Boise State University. She liaises with the Philosophy, Psychology, and Sociology departments, and is active in working groups investigating user experience, space needs, and emerging technologies. Areas of interest include breaking down physical and mental barriers to access, developing instruction tools that effectively incorporate technology, and discovering areas where art and design intersect with librarianship. Amy Vecchione is an Associate Professor and Head of the Digital Access Unit at Albertsons Library, Boise State University. As a leader she cultivates team work, develop user centered services using user experience principles, encourages experimentation, has a strong customer service ethic, believes in seamless access to resources, and constantly strives to make libraries they best place they can be using assessment of user behavior.